A family trade since prior to 1840, specialising in repair and renewal of plasterwork to historic buildings including churches and timber framed buildings. 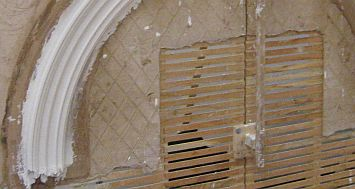 Specialisms include riven oak/softwood lath and haired lime putty plaster work, wattle and daub panels, period cornice work and limewash/distemper. Projects have included Bishop's Place, Chichester, Goodwood House, Chichester, Hambledon Church, Hampshire, St Peter's Church, Titchfield and the Merchant's House, Marlborough. The company operates thought throughout the south of England including Sussex, Hampshire, Wiltshire, Kent and Dorset. Associate Member of the Worshipful Company of Plaisterers (Plasterers). DCL Plasterers is a well-established plastering firm in St Helens. We are a plastering company to meet all your plastering needs. We specialise in traditional lime, heritage and modern plastering practices, internal and external plastering and most fibrous plastering. We have many years experience using non-hydraulic lime plaster and hydraulic lime plaster, as well as all gypsum and modern renders. We are associated members of The Worshipful Company of Plaisterers. Geoffrey Preston is one of the UK’s leading architectural sculptors, creating sculpture and decorative plasterwork for buildings, interiors and gardens. He studied at Hornsey College of Art and was a founding director of two of the country's most respected conservation companies, at the helm of many significant projects including the restoration of the 18th century hand-modelled plasterwork at Uppark House. Recent projects include the new Great Drawing Room ceiling at Great Fulford (commended in the 2013 Georgian Group Awards and winner of the 2013 Plaisterer’s Trophy), and a commission for a landscape in stucco for the Royal Albert Memorial Museum. Formed in 1990, we are experts in the field of interior and exterior moulded work and strive to produce the very highest quality work. As an experienced plastering company, we offer a large range of plaster products including Georgian, Victorian, Edwardian and other mouldings. We work on residential homes, new build properties, listed buildings, exterior work such as GRC, GRP, stucco, interior work such as run in situ, lath and plaster, restoration work that includes cleaning, restoring, manufacturing and fixing. We also offer a match to existing service.